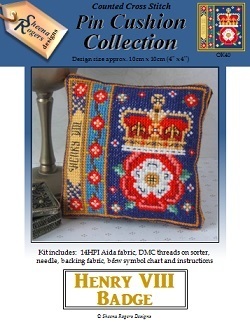 This pincushion design features the Badge of King Henry VIII. The emblem shows a crowned Tudor Rose . After the War of the Roses, Henry VII (Henry VIII's father), adopted the Union Rose which combined the White Rose of York (signifying love and faith) and the Red Rose of Lancaster (signifying grace and beauty) and is what we commonly refer to as the Tudor Rose. The design also includes a border of Tudor roses set against a deep Turquoise background, with Henry's name down the left hand edge on a background of light gold, all framed with rich gold and sapphire blue threads.